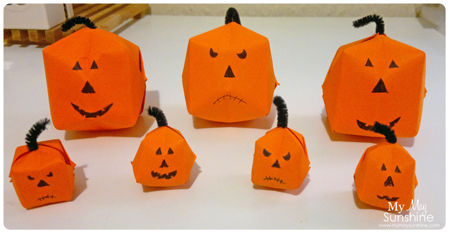 I love to make things using origami, like flowers and stars and so when it came to Halloween, I really wanted to use some origami. 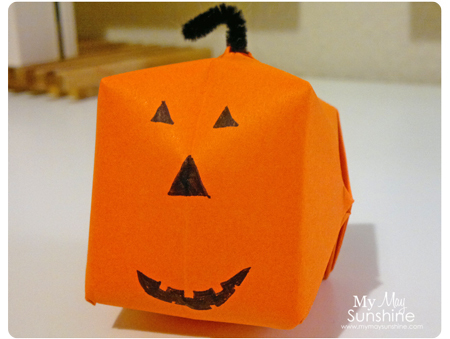 I came across this tutorial to make pumpkins and thought I would give it a go. I thought the tutorial was easy to understand and I quite enjoyed making them. I made some big ones and some small ones. 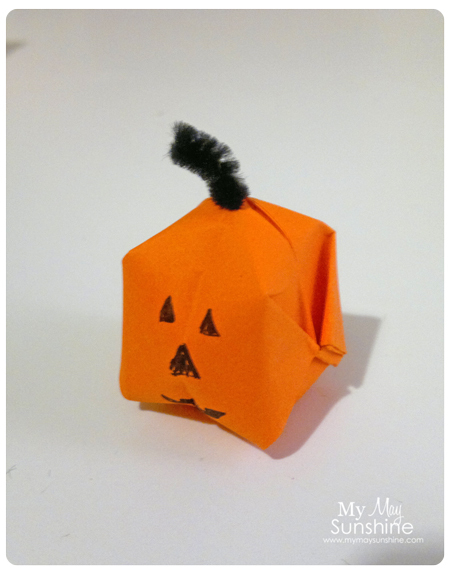 To make the pumpkins, I used to some 8 x 8 orange paper, black pipe cleaners and black pen. For the small ones, I used 4 x 4 inch paper. I did think they would be too fiddly to make but they were fine and Hollie really the little ones. The pipe cleaner fits neatly in the top of the pumpkin and then I just bent it slightly. 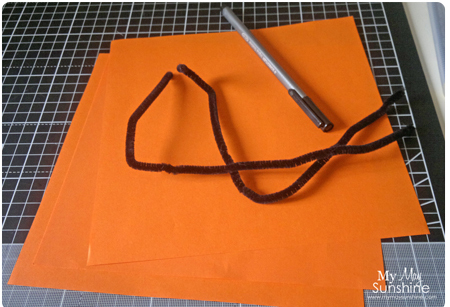 You don’t need to use of the pipe cleaner for each one so one pipe cleaner can go along way! and some with mean faces. The best bit for Hollie was the point when you have to blow air into the pumpkin to inflate it and they come to life. 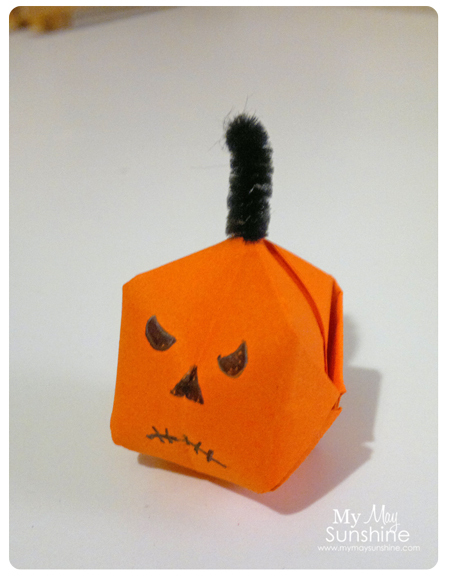 These pumpkins were really easy to make, didn’t take too long to make lots and we had the paper and the pipe cleaners in Hollies craft box so we didn’t have to buy anything extra. Even better. However, I decided I wanted to make some other things, using origami, for Halloween and so that meant a trip to Hobbycraft. Won’t say no to a trip to Hobbycraft! 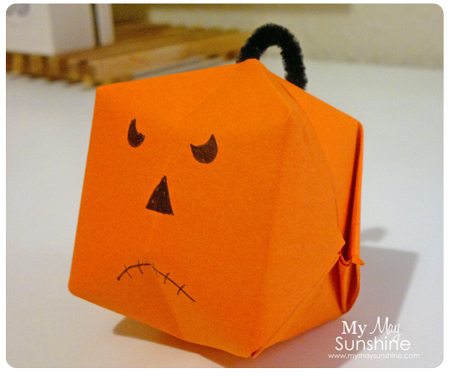 I have some more origami Halloween crafts to come later this week. See you then. Linking up to Sew Much Ado , Clean and Scentsible, Somewhat Simple, The 36th Avenue, The Shabby Creek Cottage, Yesterday on Tuesday, Chic on a shoestring, Polkadot Pretties, Sew Can Do, Skip to my lou, A Bowlful of Lemons, Todays creative blog.